The alteration of place names and the construction of national identity in Soviet Armenia. The Soviet practice of altering place names to serve political ends is well known. The Armenian SSR presents an interesting example of this practice, as it was systematically applied there, and at the same time served the nationalist agenda. Due to mass deportations of the Armenian population by Shah Abbas in the seventeenth century, most Armenian place names had already been replaced by Turkic toponyms when Armenia became a part of the USSR in 1921. The most prominent feature in the successive toponymic change is a practically complete reversal to the Armenian toponymic landscape in the Armenian SSR. The motivation for such a practice was nurtured by the anti-Turkish sentiments harbored by the Armenian society following the genocide of Armenians in 1915. Soviet authorities found these sentiments preferable to potential separatist and anti-Soviet tendencies. Nonetheless, at the same time the policy of place-naming remained closely controlled by Moscow bureaucrats and conditioned by the general ideological and political climate, under which the restoration of the original Armenian place-names became impossible due to their commonly religious character. As a result, the new place-names were frequently Armenian in form but Soviet in meaning. The article thus reveals a system of latent nationalist policies aimed at constructing a national identity acceptable within the Soviet ideological framework. 1Place-names are some of the most durable of national symbols. They can outlive most material artefacts of a civilisation. The material components of the cultural landscape may disappear or be destroyed, the civilisation that created them may also disappear but its place-names will most probably survive. In this capacity place-names are important features of national and territorial identity. According to D. W. Meinig, “Every mature nation has its symbolic landscapes. They are part of the iconography of nationhood, part of the shared set of ideas and memories and feelings which bind a people together.”1 Ethnic groups that have preserved their national identity are especially sensitive about the maintenance of the national landscape. Often the national toponymy is the only witness to the fact that a territory belongs to a particular ethnic group. Most definitions of any ethnic community -- tribe, nationality, nation necessarily mention the common living space of that ethnic group. Within that territory a national toponymy has been formed -- a system of geographic names in the native language of the indigenous population. “The existence of these names clearly defines the territory of that ethnic group and is one of the most important expressions of the national identity. The use of national toponymy ensures historical continuity, preservation of cultural traditions of a nation. [...] The native toponymy acquires special meaning for small stateless nations as it alone identifies their national territory.”2 It is therefore not surprising that place-names and ideology are related. The conscious use of place-names by a state can be seen as an instrument to preserve the unity and uniqueness of the nation ; to enforce in the national consciousness its moral right to inhabit a particular territory ; to protect its land from the territorial claims of its neighbours ; or to justify its own territorial claims. A recreated or artificially created place-name landscape is a symbolic part of national identity. Therefore, toponymy is an important part of a state’s or nation’s ideological system. 2From the point of view of traditional onomastics all place-names undergo continual development within a language changing phonetically and semantically. The former type of change consists of primarily sound shifts in a language, and the latter changes occur from cultural transformation when some words are lost from common usage. Both changes eventually lead to the obscuration and substitution of the original meaning.3 The situation of languages in contact is much more complex as both languages exercise a mutual influence on the place-names, leading to a more complicated pattern of place-name changing which includes phonetic transfer from one language to the other, translation, folk-etimological transfer, and visual transfer. This often results in conflicting situations arising from different cultural and ethnic emotional attitudes.4 We have thus established that place-name alteration, be it within one language or between several languages is not an unusual phenomenon. The goal of this paper however, is not to trace the linguistic transformations and origins of the place-names in the Armenian SSR, but to understand the ideological and political motivation behind the place-name changes. This means that the classifications of place-names employed here reflect purely political perceptions rather than true origins of a place-name. To illustrate this point : a number of Turkic place-names are adaptations of the earlier Armenian place-names, however, from the nationalist Armenian perspective they remained Turkic. 5 Peter G. Lewis, “The politics of Iranian place-names,” The Geographical Review, 72 (1982): 99. 3It is common for revolutionary regimes to create new state symbols to “remove evidence of the deposed regime and to establish an identity for the usurper.”5 This is exactly what the Soviet Union did by destroying the churches, monuments, institutions and place-names of the Tsarist regime.6 The Bolsheviks undertook unprecedented place-name changing campaigns managing to replace up to half of all place-names in the USSR.7 To sum up, it is possible to say that any place-name changes in the USSR were directly related to the ideological, political and national policy of the authorities.8 The place-names policy was regulated at the highest Soviet level by the decrees of the Central Executive Committee, and the Supreme Soviet. 10 G. R. Stewart, op. cit. : 53. 4The South Caucasus was an arena of constant warfare between the Ottoman and Persian empires for some three hundred years from the fifteenth century. The character of those wars had a devastating effect on the region. Both sides implemented a scorched earth policy to deprive their adversary of resources and to impede their advance. To this end large-scale deportations of the indigenous population were carried out, particularly by the Persians who were predominantly on the defensive and needed to stop the advancing Ottoman troops.9 Hundreds of thousands of people were displaced in this manner ; their villages remained deserted and after some time were inhabited by nomadic Turkic tribes. This situation of constant warfare had a profound impact on the place-names in the region and especially in Armenia. This situation closely matches the circumstances described by G.R. Stewart : “If the transfer of the territory occurred in haste and under stress, during a warlike invasion, when some horde may have descended upon a district and slaughtered the inhabitants so quickly and so totally that killers learned no names we shall expect less care in rendering than if it took place during friendly and leisurely contacts of trading.”10 Under these conditions, the total replacement of the cultural landscape becomes possible. In the case of Eastern Armenia, deportations took the place of a massacre so that new arrivals would not be able to learn the original place-names. This argument is reinforced by the Russian nieneteenth-century explorer of the South Caucasus Ivan Shopen who wrote that : “Geok-Chai magal [district] after the devastation of the previous century remained entirely empty so when the last Yerevan sardar Hussein-Khan undertook to resettle it with Karapapakhs in 1814 no one could remember the names of its destroyed villages, that have since received new names.”11 Other indirect evidence pointing at forced migrations is that a number of Turkic place-names in Armenia have the Arabic-Turkic root harab/haraba, meaning ruins. Over the centuries, the highly unstable political situation in the region, the large-scale displacements of the Armenian population and the penetration of Turkic nomadic tribes resulted in a dramatic transformation of the ethnic composition of the region and its cultural landscape. The Armenian toponymic nomenclature partially survived, but is largely adapted, altered, or entirely replaced by the Turkic one. 13 Ivan Shopen, op. cit. : 639-642. 6This table shows that by 1926 the Armenian population formed an 84.4 % majority in the republic overall (8.8 % Turkic); 89.2 % (149,183) majority in urban areas (3.4 % (5,703) Turkic), and 84.8 % (605,393) in rural areas (10.1 % (72,525) Turkic). 7The “Armenian Question” was brought into the international agenda at the Berlin Convention of 1878, which obliged the Ottoman Government to carry out reforms in the Armenian provinces.17 Meanwhile, Armenian national ideology was under the strong influence of the national-liberation movement in the Balkans as well as of the ideas of the Russian socialists, the “Narodniki ” in particular.18 The Armenian political parties that emerged in the late nineteenth century were mainly concerned with the liberation of Western (Turkish) Armenia. Their ideas were further fuelled by the demands for autonomy and reform for Armenia that were being made in the European and Russian diplomatic notes of the time. This rising Armenian nationalism was necessarily in sharp conflict with the emerging Turkish nationalist ideology. The Ottoman State under Sultan Abdul-Hamid II responded by carrying out the Armenian massacres of the late nineteenth century. This policy eventually culminated in the Armenian genocide of 1915, when almost the entire Armenian population was erased from Western (Turkish) Armenia, which put an end to all hopes of an independent Armenian state in Western Armenia. Given the importance of the notion of an independent Armenia, it is clear that the events of 1915 had the most profound and traumatic effect on the Armenian national identity. 8Having outlined the aspects of the Armenian national identity, demographic circumstances and origins of place-names in the Armenian SSR we can now turn to the ideological use of renamings in Soviet Armenia. This part will address four aspects of the renamings -- the mechanism of renamings will unveil the Soviet bureaucratic procedures that led to the place-name renaming. The dynamics of renamings will address the relationship between the ideological and political developments in the USSR and renamings in Armenia. The scale of renamings will deal with the fluctuating numbers of place-names in Armenia and the spatial distribution of the renamings. Finally, the nature of renamings will be analysed in the last part. 11I should point out that this mechanism was reconstructed through the analysis of a number of documents that cover the period from 1930 to the mid 1950’s. So far, I have not discovered a single document that contains a direct reference to all the components of the process. Nevertheless, it is clear that the politics of renamings was under tight political control. The influx of the population from beyond the republic in the post-war years is also caused by considerable extension of irrigated lands in the Kura-Araks lowland and by transmigrating to the republics the Azerbaijanis from Transcaucasian, Central Asian republics and some other regions that was organized in connection with it (during the years from 1948 to 1952 from the Armenian republic alone approximately 58,000 people were transmigrated to Azerbaijan)30. 14These waves of emigrations of the Azerbaijani population and immigrations of Armenians were apparently one of the major causes for renamings in the Armenian SSR in the post-war period. We should also consider the general decline in Russo-Turkish relations in the aftermath of the Second World War, and Stalin’s demands for the return of the territories seceded to Turkey in 1921.31 The post-war renamings campaign ended in 1950, and the annual number of renamings steadily declined until 1967-1968. 15The years 1967 and 1968 were marked by a sudden increase in renamings when more than 50 place-names were changed. The explanation for this phenomenon could be the attempt of the local authorities to accommodate the resurgence of Armenian nationalism that occurred two years earlier. Let us assess the events of 1965 and their possible impact on the rise of renamings two years later. The unauthorized demonstrations took place in Yerevan in April 1965 to commemorate the 50th anniversary of the Armenian genocide in the Ottoman Empire. The event was not a totally unexpected one as there are indicators that it was anticipated. The local Kommunist newspaper published an article about one of the leaders of the Armenian liberation movement Andranik Ozanian whose very name was previously banned in the USSR several weeks before April 24. Immediately before the demonstrations the top official Soviet newspaper Pravda published an article about the Armenian genocide on April 24th -- the day that is commemorated as genocide day. The article was reprinted by the Armenian Kommunist the next day.32 The most unusual aspect of this event was that the Soviet authorities did not resort to violence as they had previously on similar occasions.33 Even though the absence of violence could have been interpreted as Soviet tolerance of the Armenian national (anti-Turkish) sentiment, it was however clear that the unauthorized nature of the demonstrations could not pass unnoticed. These events eventually lead to the resignation of the First Secretary of the Central Committee of the Communist Party of Armenia, V. Zorobian in 1966. One of the official reasons for his resignation was : “shortcomings in the ideological work of the party organisations [and] especially with the youth.”34 Once the issue was resolved with Zorobian’s removal the new Armenian communist leadership could make further concessions to Armenian nationalism to gain popular support. Indeed, the years 1967 and 1968 were marked by a set of symbolic gestures to nationalist sentiments. 16One of the most notable consequences of the 1965 demonstrations was the construction and opening of the memorial to the victims of the genocide in Yerevan in 1967. This was clearly a concession to the national and especially anti-Turkish sentiments present in Armenian society. The new First Secretary of the Armenian Communist Party A. Kochinian attended the opening ceremony, which shows that the communist authorities took the mood of Armenian society seriously. In order to highlight the role of the Communist Party and to downplay the nationalist component of the event, the opening ceremony took place on November 29th the day of the sovietisation of Armenia, instead of April 24th as one might have expected.35 This ‘Solomon’ decision demonstrates that the local authorities needed to balance carefully the two tendencies -- communism and nationalism, while trying to expertly combine them. 17Yet another monument was opened in Armenia in 1968. This memorial was to celebrate the 50th anniversary of the Sardarapat battle of 1918. The battle between Armenian troops and the advancing Turkish army saved Armenia’s capital by diverting the Turkish advance. The first secretary A. Kochinian again attended the ceremony to highlight the importance and significance of the event. Again, the date was carefully selected -- May 26th -- the day the Sardarapat battle began, rather than May 28th -- the day of victory and of the declaration of Armenian independence.36 Along with these visible symbolic concessions to Armenian nationalism, a renaming campaign took place in 1967 and 1968. It is in this context that one should view the renamings of 1967-1968, as they were hardly accidental. Following the unauthorized demonstrations of 1965, the Zorobian leadership was more reluctant to make any concessions to nationalist sentiment, as from Moscow’s point of view, that would undoubtedly look provocative and could lead to accusations of nationalism. It is clear therefore why during the years 1965-1966, there were no renamings or any other expressions of nationalism. Moscow’s stance became clear with Zorobian’s “punishment” for the lapses in discipline, and notably, the absence of explicit condemnation of Armenian (anti-Turkish) nationalism. The new Armenian leadership was free to make concessions to nationalist sentiments and as a result the years 1967 and 1968 were marked by such symbolic gestures as the construction of monuments and renamings. Following the rise of Armenian nationalism and the renaming campaign of 1967 and 1968, there were virtually no renamings for another decade. 18It was only in 1978 that another significant increase in renamings occurred when 91 place-names were changed. Once again, the explanation for this increase in renamings may be Armenian nationalism. It appears that Moscow’s attempt to limit the constitutional rights of the Union republics (in particular, with regard to the very sensitive language issue) produced a nationalistic response in the form of the renaming campaign. A major propaganda campaign was conducted in the central Soviet press in the wake of the replacement of the old, so-called “Stalin’s Constitution” (of 1936) in 1977 and 1978. It was clear that the aim of the campaign was to prepare the general public to expect further limitations in the rights of the Union republics. Even the federate nature of the USSR was questioned in favour of a unitary state. The Kremlin’s desire for higher centralisation of the state was evidently shown in the project of the USSR Constitution, published in 1977. For instance, even the formal right to have military formations in the Union republics was removed. It was also proposed that Russian should become the state language.37 In addition to the imminent changes in the USSR Constitution, the individual constitutions of the Union republics were also expected to change. With the unmistakable trend to the centralisation in the USSR constitution, it was natural to expect further limitations of rights at this time in the republican constitutions. When the drafts of the Armenian, Azerbaijani, and Georgian constitutions were published in 1978, there was no mention in the local press of the state languages of the republics. The authorities apparently expected discontent over the absence of the state language article in the constitution and as a concession to the national feelings the drafts of the Armenian and Georgian Constitutions mentioned “state concern for the development of the language.” This encroachment attempt generated resentment and protests took place in Tbilisi and Yerevan in April 1978.38 As a result, the Soviet authorities opted for preserving the language articles not only in the Armenian and Georgian constitutions but also in the Azerbaijani one. The three South Caucasian republics were the only ones to retain the state language articles among all the Union republics. It seems that the renaming of place names intended to demonstrate the position of the local communist authorities towards the language issue by reinforcing the Armenian-ness of the republic. Therefore, the place-name replacements of 1978 in Armenia should be seen in the context of the changes in the Soviet constitution. The Chart 1 summarises the dynamics of place-names replacement. 19This analysis is based on the following sources : the earliest source on place-names is the large-scale map (1:200,000) of the Armenian SSR published in 193239 which gives a very detailed picture of Armenian place-names at that time. Other important sources of data were the six issues of the official publication Administrative-territorial division of the Armenian SSR.40 These volumes were published primarily for local administrators and apparently contained a complete list of populated places in Armenia. To assess the scale of renamings it is necessary to establish the number of populated places in the Armenian SSR. Surprisingly, it is rather difficult to give a definite figure for the total number of place-names, as this was not constant. There are evidently two reasons for these variations. Firstly, the number of place-names differed significantly because of boundary changes with neighbouring Soviet republics.41 Overall, the total territory of the Armenian SSR diminished by more than 1,000 sq. km during the entire Soviet period. Also, social and political processes within the USSR such as industrialisation, urbanisation, deportations and resettlements also led to a constant decline in the number of place-names. 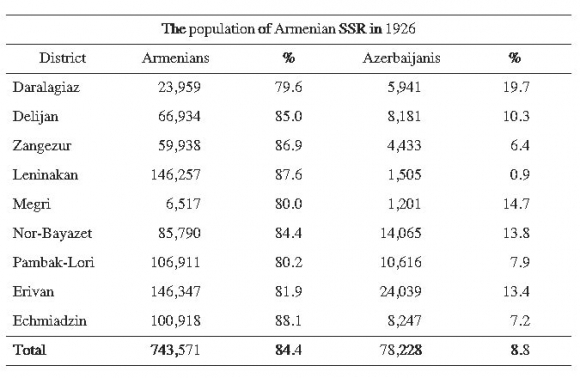 The Soviet population census of 1959 showed that there were 1,026 villages in the Armenian SSR. This figure included 65 villages with a population between 5 and 50 people.42 The Chart 2 summarises the changes in the numbers of place-names in Armenian SSR. 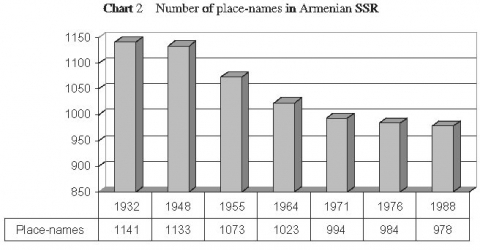 20It is clear that during the 1932-1988 period, the number of place-names in Armenia fluctuated by 15 %. 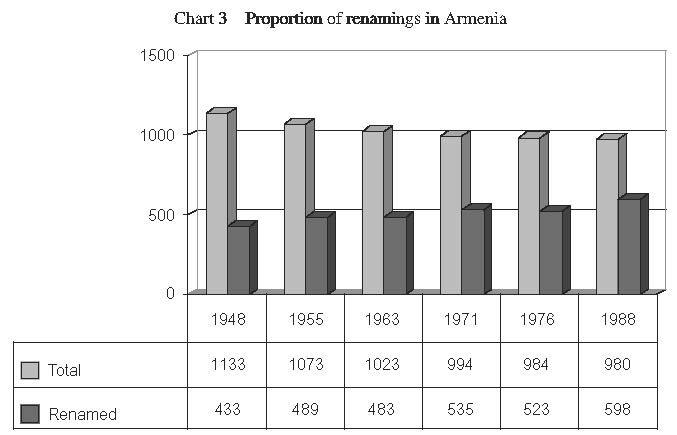 As the total number of place-names in Armenia declined, place-name renamings became more frequent. The decline in the number of renamed place-names only occurred between 1955 (489 renamings) and 1964 (483 renamings). The impact of the renaming policy is evident. 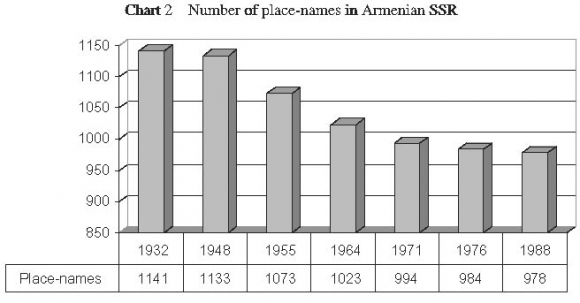 By 1988 some 60 % (598 out of 980) of place-names in the Armenian SSR had been renamed (see Chart 3). 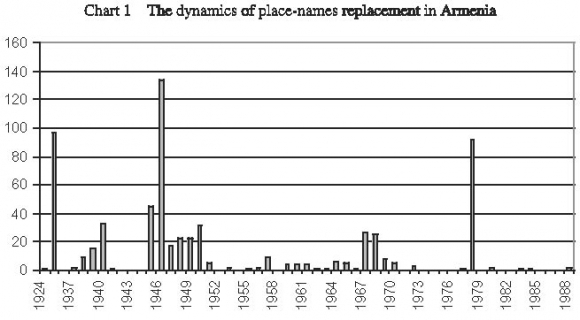 This figure exceeds the highest estimates of the Soviet place-name renamings which some authors place at around 50 %. 21This unusually high figure reflects the total change of the cultural landscape of the Armenian SSR. If we also consider the spatial distribution of the renamed place-names up to 1988 (see Map 1), it is clear that the distribution of the renamings varied from 12 % in some districts to nearly 100 % in others. Place-name renamings were most numerous in the central valleys, whereas the fewest occurred in the mountainous and forested areas of the South and North-East of the country. The explanation for this is that the valleys of Armenia were badly affected by the Turkish-Persian wars of sixteenth-eighteenth centuries, with the loss of their cultural landscape, while the inaccessible areas of the North-East and South were relatively unaffected by those events. 43 Geograficheskie naimenovaniia Armianskoi SSR (Yerevan 1951): 11. 22To present as complete a picture of the renamings in Armenia as possible, I will also briefly address the question of physical-geographic toponyms. The main source for this analysis is a book Geographic names of the Armenian SSR, published in 1951. The publication contains names of “all mountain ranges, plateaus, most mountain passes, major mountains and peaks, large rivers and tributaries, and 1/4 of the lakes”43 i.e. the list of names of physical features is not a full one. The new (i.e. renamed) and old place-names are listed in one list in alphabetical order, which makes it impossible to make any comparison between renamed and old toponyms. Therefore, I had to compose the list anew. The limited resources for this analysis do not allow one to determine whether there was any temporal or spatial pattern to the distribution of the renamings. It is therefore clear that this analysis has some limitations but it should suffice as a general illustration for the major trends. 23There are 107 hydronyms in the list, 71 (66 %) of which were renamed. There were a number of hydronyms, each with a distinctly Turkic stem relating to water : -çay (river), -gŒl (lake), -bulaﬁ (stream, spring), -su (water meaning river). There were 26 of these toponyms, most of which were changed for their Armenian equivalents. Thus -gel was changed for -lich (out of 12 stems -gŒl, 11 were changed into lich), -bulaﬁ was substituted by akhbiur (out of 4 stems -bulaﬁ, 2 were changed into -akhbiur and one into Russian -rodnik), the only Turkic stem -su was changed into its Armenian equivalent -djur. The situation with 9 Turkic stems -çay was different as only one was replaced by an Armenian equivalent -get while in the remaining 8 cases the stem was dropped completely in the new name. If one considers the method of renamings, it is possible to distinguish four categories. 1. Loan-translation or calque when the entire place-name is fully translated, for instance : Turkic KaragŒl into Armenian Sevlich (black+lake); Balihli into Dzyknaget (fish+river). 2. Semi-calque or hybrid renamings : Šorbulaﬁ into Mushakhbiur; KaragŒl into Karilich (in these two pairs only the second part of a toponym is translated). 3. Linguistic adaptation : Kafan into Kapan (Hapan), Ertapin into Artabun. Finally, the fourth category is a complete substitution : Basut into Tsav; Çayzami into Kashuni. These four categories are distributed rather unequally as there were 5 cases of loan-translation or calque, 12 cases of semi-calque or hybrid, 27 cases of adaptation, and 29 cases of complete substitution. Thus, more than half of the renamed hydronyms have retained continuity with the old ones. 24Out of 315 listed oronyms, 164 (52 %) were renamed. Following the pattern established for hydronyms we can apply the same four categories here as well. There were 8 instances of loan-translation or calque, for instance : Akdaﬁ into Spitakasar (white+mountain); Damurli (Demirli) into Erkrasar (iron+mountain). There were 14 cases of semi-calque or hybrids : Murad-tapa (-tepe) into Muradsar, Kamarkaya into Kamarkar. Adaptation was the most widespread method of renaming, being used in 98 cases. For example : Hartinlar into Hartinler (Turkic plural ending -lar substituted here by Armenian word for mountain -ler), Išihli into Ishhansar. The second most common way of renamings was complete substitution (44 cases), such as : Maman into Tsahkadzor, Boﬁutlu into Ardeni. In the case of oronyms, the number of Turkic stems for mountains is insignificant : -daﬁ (mountain) -- 17 cases, -tapa (tepe) (hill) -- 9 cases, -kaya (rock, cliff) -- only 4 cases. These Turkic word-formants were changed in the following way : out of 17 words -daﬁ, 10 were translated into its Armenian equivalent -sar ; 6 out of 9 -tapa were changed either into -sar or -blur ; and all 4 -kaya were changed into -kar. As was the case with the hydronyms a large proportion of renamed oronyms maintain continuity with the old toponyms (120 out of 164 or 73 % to be precise). This short overview of the renamings of natural features demonstrates that the general trend in the Armenian SSR was to replace Turkic toponyms with Armenian ones. 25This paper addresses the role of place-names in the national identity, and it is the “national” aspect of place-names that we are interested in. One approach is to sort place-names according to their “national connotation.” However, from the point of view of traditional onomastics this is difficult. Nearly every place-name contains elements from different linguistic layers and from different periods, so it is impossible to speak of the “national connotation” of a place-name. We deal firstly with an artificially created toponymic landscape. The origin of a place-name is well known, its etymology is completely clear, and the circumstances that led to and the timing of its emergence are known. Then it is the symbolic role and meaning of a place-name that are more important than its actual etymology. It is how a particular place-name is being perceived by a population rather than what it actually is that matters for the assessment of its role in the national identity. Therefore, we can speak of the “national connotation” of a place-name when it is necessary to understand its role in the national identity. Having said that, we can distinguish four major place-name categories of the new place-names in Armenia. Armenian place-names ; Turkic place-names, socialist place-names ; and other place-names (see Chart 4). 26From this chart it can be seen that the majority of the renamed place-names were Armenian, followed by “socialist” place-names, “Turkic” place-names and finally an insignificant number of “other” place-names. If the categories of “Armenian” and “Turkic” place-names are self-explanatory, then the category of “socialist” place-names deserves more explanation. The famous Soviet ideological formula “national by form, socialist by content” was widely applied in place-naming policies within the Union republics. Several methods were used to implement the formula. One method was to use the names of the local communists. In Armenia there were Stepanavan and Shaumian (both places named after an ethnic Armenian Bolshevik, Stepan Shaumian), Mikoyan and Anastasavan (named after another Armenian Bolshevik Anastas Mikoyan). In Azerbaijan there were Azizbekov, Narimanabad, Hanlar (all named after local communists). In Georgia there were Tshakaya, Ordzhonikidze, Tsulukidze. Another group of Soviet toponyms originated from the standard figures of the Soviet pantheon “Lenin” and “Stalin.” The base word was modified by adding the local place-formant -- Leningrad (RSFSR), Leninakan (Armenian SSR), Leninabad (Tadjik SSR), Leninzholi (Kazakh SSR), Leningori (Georgian SSR), Stalingrad (RSFSR), Stalino (Ukrainian SSR), Staliniri (Georgian SSR). Yet another category of Soviet toponyms was derived from words that were important to the Communist regime, such as “October,” “May,” or neologisms “Soviety” and “Komsomol.” Thus in the Armenian SSR there were Sovetashen, Mayisian, Hoktemberian and Noyenberian (the Sovietisation of Armenia occurred in November 1920) in Azerbaijan there were Oktiabriabad, Birmay (1 May), etc. 27Hence, within the ideologically motivated Soviet place-names, it is possible to distinguish the national markers. In the case of Armenia there were three sub-categories of socialist place-names -- “Armenian-socialist,” “Azerbaijani-socialist,” and “neutral-socialist.” Examples of “Armenian-socialist” have already been mentioned Shaumian and Mikoyan. Azizbekov was an “Azerbaijani-socialist” place-name (named after Meshadi Azizbekov, an ethnic Azerbaijani and member of the Baku Commune). Another category of socialist place-names was “neutral-socialist.” Unlike the first two categories of place-names which had clearly distinguishable ethnic markers, the “neutral-socialist” place-names were free of Armenian or Azerbaijani connotations. For instance : Fioletovo (after Ivan Fioletov an ethnic Russian member of the Baku Commune) or Kalinono (after Mikhail Kalinin the chairman of the Central Executive Committee of the USSR). The distribution of these sub-categories of “socialist” place-names in Armenia can be seen from Chart 5. 28“Armenian-socialist” place-names once again made up the majority, followed by the “neutral socialist,” and “Azerbaijani-socialist” place-names. The nature of the changing cultural landscape of Armenia can be seen by comparing the maps showing Turkic and Armenian place-names in 1932 (Map 2), with a later map from 1988 (Map 3). It is clear that the place-naming campaigns that took place in the Armenian SSR succeeded in largely replacing the Turkic place-name landscape with an Armenian one. 29One more aspect of renamings in Armenia also deserves mention. Renamings have always reflected the demographic circumstances on the ground. Thus, Armenian place-names only replaced Turkic place-names if the population of the place was Armenian. If the population was Azerbaijani, the new place-name would either be Turkic or Azerbaijani-socialist. The Zangibasar district was created on December 31, 1937 from parts of the Echmiadzin and Artashat districts. It was the smallest district in Armenia with an area of 160 sq. km. The majority of its 31 place-names as well as its population were Turkic. All of the 11 renamings that occurred in the district were mere replacements of one Turkic place-name by another. The district was abolished sometime between 1948 and 1955 (probably in 1949 as a result of the Soviet policies of Azerbaijani resettlement). After 1948, several renamings occurred there from Turkic into Armenian, which indicates the changes in ethnic composition of the district. In fact, the creation of this small district with its mainly Turkic population and the nature of renamings there during the decade 1937-1948 indicate that the Azerbaijanis received unofficial cultural autonomy. By late 1980’s there were 152 Azerbaijani villages in the Armenian SSR all with Turkic place-names. The renamings of the Azerbaijani villages always retained the Turkic character -- Karakoyün (Azizlu), Karaçanta (Azizbekov), Canahmed (Günasli), Itkran (Gülistan), Ilanli (Çaybasar). 30Similarly, unacceptable to the Soviet regime Russian place-names were replaced by Armenian ones if there was little or no Russian population left, for instance Elenovka was renamed Sevan. However, when the Russian population was present the renaming would reflect the ethnic character of the place, for instance : Russkie Gergeri -- were renamed Pushkino (after the Russian writer A.S. Pushkin); Voskresenovka (an unacceptable religious name meaning Resurrection) was renamed Lermontovo (after the Russian poet Lermontov); Vorontsovka (after the Caucasian Viceroy Count Vorontsov) was renamed Kalinino, and finally Nikitino (after the Tsarist officer) was renamed Fioletovo. 32The decline of the initially strong communist ideology in the USSR and the rise of nationalism in the Soviet society especially after WWII. 33The ideological trends of the USSR took place in Armenia as well. In the Armenian SSR they acquired a unique direction determined by the specific features of the Armenian national identity. 34The events of 1915 in the Ottoman Empire have created a strong anti-Turkish sentiment, which eventually influenced the policy of the Armenian communists. 35This policy was only possible under the following conditions : the Soviet authorities were always anxious about separatism and therefore the anti-Turkish direction of Armenian nationalism was perceived as less dangerous and was tolerated. 36In the course of the 70 years of communist rule, the Armenian communists contributed greatly to the formation of the Armenian national identity. The destruction of the Turkic cultural landscape and the re-creation of the Armenian one has been a symbolic way to overcome the traumatic experiences of 1915. 1 D. W. Meinig, “Symbolic landscapes,” in id., ed., The interpretation of ordinary landscapes (New York: Oxford University Press, 1979): 164. 2 E.M. Pospelov, “Natsional´naia politika SSSR i toponimiia,” in Toponimika i mezhnatsional´nye otnosheniia (Moscow : AN SSSR, Moskovskii filial Geograficheskogo obshchestva SSSR, 1992): 3. 3 George R. Stewart, Names on the globe (New York : Oxford University Press, 1975): Part I, chapters 6 and 8. 4 Ivan Lutterer, “Czech-German language contacts in the toponymy of Bohemia ;” J. B. Rudnyckyj, “Names in contact : Canadian pattern ;” G.F. Delaney, “Language problems in Canadian toponymy ;” in Henri Dorion, ed., Les noms de lieux et le contact des langues = Place names and language contact (Québec : Les Presses de l’Université Laval, 1972). 6 I would like to stress the important difference between the material symbols that affect primarily a visual perception and place-names that aim at embedding ideological and aesthetic values into the consciousness. 7 Charles B. Peterson, “The nature of Soviet place-names,” Names, 25, 1 (1977): 15-24; N. V. Podol´skaia, “Sviazi demografo-etnicheskikh i toponimicheskikh protsessov,” in Toponimika i mezhnatsional´nye otnosheniia (Moscow : AN SSSR, Moskovskii filial Geograficheskogo obshchestva SSSR, 1992): 24; John Murray, Politics and place-names. Changing names in the late Soviet period (Birmingham : Birmingham Slavonic Monographs No. 32, University of Birmingham, 2000): 1. 8 Along with the establishment of ideologically motivated place-names there were place-name campaigns that can be seen as Russian nationalistic. For instance, Finnish place-names were replaced by the Russian ones on the territories annexed from Finland with the exception of Karelo-Finnish ASSR. (Charles B. Peterson, art. cit. : 23). Even before the Second World War the mass deportations of people accused of collaborating with the Nazis -- Crimean Tatars, Volga Germans, Kalmiks, Balkars, Karachay -- were followed by mass renaming campaigns, when Russian and Soviet place-names were imposed. The same tendency was revealed after the war in Eastern Prussia (present-day Kaliningrad oblast´ of Russian Federation), when all German place-names were replaced in July 1946 by Russian and Soviet place-names. A similar fate befell the Japanese place-names in the Southern Sakhalin and Kuril Islands after the Second World War. The deterioration of Russian-Chinese relations in December 1972 resulted in the replacement of Chinese place-names in the border districts (Charles B. Peterson, art. cit. : 15-24). Up to 500 place-names were changed in the Far East. (B.A. Diachenko, “Pereimenovaniia v primor´e,” in Vsesoiuznaia nauchno-prakticheskaia konferentsiia “Istoricheskie nazvaniia -- pamiatniki kul´tury” 17-20 aprelia 1989. Tezisy dokladov i soobshchenii (Moscow, 1989): 111. Russification policies were continued in the late Soviet period in Ukraine and Moldova. (S. G. Berzhan, “O tendentsiiakh iskoreneniia istoricheskikh nazvanii (Na materiale natsional´nykh toponimov MSSR),” in ibid. : 112). 9 See : Dickran Kouymjian, “Armenia from the fall of the Cilician Kingdom (1375) to the forced emigration under Shah Abbas (1604),” in Richard G. Hovannisian, ed., The Armenian people from Ancient to Modern Times, vol. 2 (London : Macmillan, 1997): especially 14-21. 11 Ivan Shopen, Istoricheskii pamiatnik sostoianiia Armianskoi oblasti v epokhu ee prisoedineniia k Rossiiskoi imperii (St. Petersburg, 1852): 446. In addition the author lists 1,111 villages of the Armianskaia oblast´ and 359 of those were destroyed villages, ibid. : 485-508, 510-518. 12 M. A. Adonts, Ekonomicheskoe razvitie Vostochnoi Armenii v 19 veke (Yerevan : Academy of Science of the Armenian SSR, 1957): 496, 499. 14 Armenian refugees fled into Eastern Armenia even before the large-scale massacres began in the Ottoman Empire in spring 1915. Thus according to the data collected during the one-day census by the Erevan Statistical Committee on January 30, 1915, on the territory of Eastern Armenia there were more than 67,000 refugees -- Armenians, Greeks, Assyrians. Armenians made up some 50,000 of this total. See : Erevanskaia statisticheskaia komissiia. Odnodnevnaia perepis´ bezhentsev iz Turtsii, Persii i iz mest pogranichnykh s Turtsiei (armian, aisorov, grekov i dr.) 1914-1915. Perepis´ proizvedena 30-go Ianvaria 1915 goda (Yerevan : “Luis,” 1915): 38-39. 15 Richard G. Hovannisian, The Republic of Armenia, vol. 1: The first year, 1918-1919 (Berkeley - Los Angeles : University of California Press, 1971): 48. 16 Zakavkazskoe Statisticheskoe Upravlenie. Naselenie Zakavkaz´ia. Vsesoiuznaia perepis´ naseleniia 1926 g. Kratkie itogi (Tiflis, 1928): table 6, p.13. 17 J. C. Hurewitz, The Middle East and North Africa in world politics. A documentary record, 2nd ed., revised and enlarged, vol. 1: European expansion, 1535-1914, compiled, translated, and edited by J.C. Hurewitz (New Haven - London : Yale University Press, 1975): 414. 18 M. R. Kochar, Armiano-Turetskie obshchestvenno-politicheskie otnosheniia i armianskii vopros v kontse 19 -- nachale 20 vekov (Yerevan : Izdatel´stvo Erevanskogo Universiteta, 1988): 17-19. 19 “Nor Kazmvoh Bnakavajreri Tomaragrman ev Anvanman Kargi Masin : 19. 01. 1927,” Haikakan SSR Orenkneri, Geraguin Soveti Nakhagahutian Hramanagreri ev Haikakan SSR Karavarutian Voroshumneri Zhamanakagrakan Zhohovatzu 1920-1938 tt. (Ar 1-i hulisi 1963 t. popohutiunnerov ev lratzumnerov) (Chronological collection of the laws of the Armenian SSR, the decrees of the Presidium of the Supreme Soviet and decisions of the government of the Armenian SSR, 1920-1938) (Yerevan : Haipetrat, 1963): 241. 20 Mary Kilbourne Matossian, The impact of Soviet policies in Armenia (Leiden : E. J. Brill, 1962): 80, 142. 21 Haikakan SSR Ashkharagrakan Anunner (The Geographic Names of the Armenian SSR) (Yerevan : Academy of Science of the Armenian SSR, 1951): 6, 9-10. 22 “Haikakan KhSH Varchakan-Teritorial Bazhanman Hartseri Lutsman Kargi masin. 14. 05. 1938,” Haikakan SSR Orenkneri..., op. cit. : 361. 23 This estimation is based on the following calculations : the very first edition of the administrative-territorial division of the Armenian SSR (1948) listed around 80 renamed place-names without the date of renaming. Having in mind that place-names renamings with the date of renaming began in 1935 it is possible to assume that 80 dateless renamings have occurred in the period of 1920-1934. 24 Place-name in brackets is a new one. The religious connotation here is as follows : Mollalu means Mullah ; Kilisakend is Turkish for Church ; Hojakend relates to a pilgrimage to Mecca ; -vank in Kodukhvank is Armenian for Church. 25 Kommunist (Yerevan), 5 (05.01.1935). The comparison of the list of renamings published in the Kommunist newspaper (104 renamings) with the list of renamings that appeared in the 1948 edition of the Administrative-territorial division of the Armenian SSR (97 renamings) shows that several place-names had disappeared from the map of Armenia between 1935 and 1948. 26 According to the decree of Sovnarkom of the USSR of November 21, 1945 the Armenian government received significant assets for the organisation of repatriation and for offering help to the repartees. The plenum of the Armenian Communist Party held in February 1946 had discussed “Measures on preparation for admittance and settlement of Armenians returning from abroad.” Ocherki istorii kommunisticheskoi partii Armenii (Yerevan : “Ayastan,” 1967): 445. 27 Sbornik zakonov SSSR i ukazov Presidiuma Verkhovnogo Soveta SSSR 1938-1961 (Moscow, 1961). “O poriadke priobreteniia grazhdanstva SSSR litsami armianskoi natsional´nosti, vozvrashchaiushchimisia iz-za granitsi na rodinu v Sovetskuiu Armeniiu,” Decree of October 19, 1946, p. 99. 28 Barbara A. Anderson and Brian D. Silver, “Population redistribution and the ethnic balance in Transcaucasia,” in Ronald G. Suny, ed., Transcaucasia, nationalism, and social change ; essays in the history of Armenia, Azerbaijan, and Georgia (Ann Arbor : University of Michigan Press, 1996): 488. 30 M. M. Allakhverdiyev, A. K. Aleskerov, “Regularities of changes in the territorial distribution and occupational cross-sections of the population in the Azerbaijan SSR,” in Materials on economic history of Azerbaijan (To the Vth International Congress on Economic History) (Baku : Elm, 1970): 131. 31 Bruce Robellet Kuniholm, The origins of the cold war in the Near East ; great power conflict and diplomacy in Iran, Turkey, and Greece (Princeton, NJ: Princeton University Press, 1980): 255-275. 32 M. Nersisian, “Genotsid -- tiagochaishee prestuplenie protiv peredovogo chelovechestva,” Pravda (24.04.1965); Kommunist (Yerevan) (25.04.1965). 33 For instance in 1956 in Tbilisi, or in 1962 in Novocherkassk. For a detailed summary of those events see : V.A. Kozlov, Massovye besporiadki v SSSR pri Khrushcheve i Brezhneve (Novosibirsk : Sibirskii khronograf, 1999), chapters 5 and 12. 37 Ann Shelly, “The non-Russian republics in 1977,” Radio Liberty Research, RL 294/77 (December 27, 1977). Open Society Archives. Soviet “Red” Archives/Fond 300/Subfond 610/Series 0/Box 1515/Research Bulletin 1977 (Oct.-Dec.). 38 “Demonstrations reported in capital of Soviet Georgia,” Radio Liberty Research, RL 8 /78 (April 16, 1978); and “The Georgian language and national pride prevail,” Radio Liberty Research, RL 81 / 78 (April 18, 1978). Open Society Archives. Soviet “Red” Archives/Fond 300/Subfond 610/Series 0/Box 1517/Research Bulletin 1978 (April - June). 39 Kh. A. Avdalbekian, Karta Sotsialisticheskoi Sovetskoi Respubliki Armenii, 1:200,000 (Yerevan, 1932). 40 Haikakan SSH, varcha-teritorial bazhanume ar 1 hunvari 1948 t. (Armenian SSR, Administrative territorial structure on January 1, 1948), (Yerevan, 1948); ibid. : ...ar 1 hoktemberi 1955 t. (on October 1, 1955), (Yerevan, 1955); ibid. : ...ar 1 marti 1964 t. (on March 1, 1964), (Yerevan, 1964); ibid. : ...ar 1971 t. (on 1971), (Yerevan, 1976); ibid. : ...ar 1976 t. (on 1976), (Yerevan, 1976); ibid. : ...ar 1988 t. (on 1988), (Yerevan, 1988). 41 The territory of the SSRA (Armenian SSR) in 1927 was 30,948 sq. km., it shrank to 29,697 sq. km. by 1932 and by the time of the dissolution of the USSR it had only 29,800 sq. km. (Atlas Soiuza Sovetskikh Sotsialisticheskikh Respublik, composed by A. F. Belavin, second, expanded edition (Moscow-Leningrad, 1928): 70; Kh. A. Avdalbekian, op. cit. ; I. A. Gogoverishvili, O. A. Khachalag, eds, Armianskaia SSR [Map]. (Moscow : Glavnoe upravlenie geodezii i kartografii pri Sovete Ministrov SSSR, 1990). 42 Itogi vsesoiuznoi perepesi naseleniia 1959 goda. Armianskaia SSR (Moscow : Tsentral´noe statisticheskoe upravlenie pri Sovete Ministrov SSSR, 1963): 14-15. 44 Pierce F. Lewis, “Axioms for reading the landscape,” in D. W. Meinig, ed., The interpretation of ordinary landscapes, op. cit. : 15.